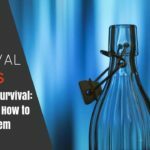 In the event that you must leave your home during a major crisis, it is to your advantage to have a personalized bug-out vehicle. Aside from giving you confidence when traveling over rough terrain or strange places, a good bug out vehicle can provide a place of safe shelter as well as enable you to expand your stockpile options. 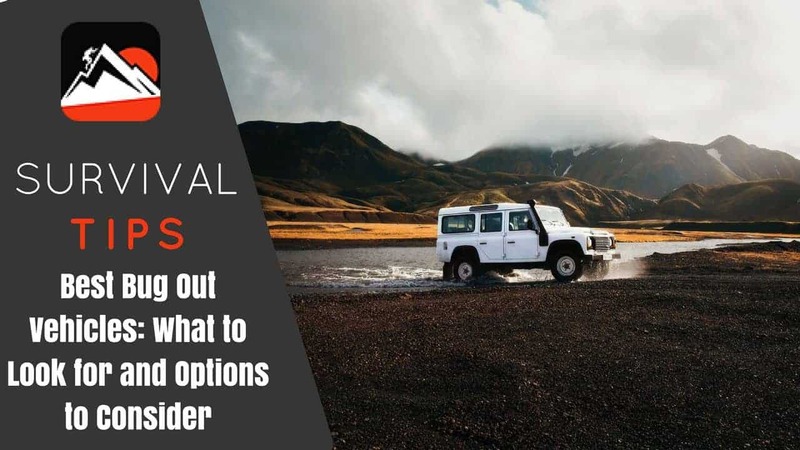 Since personalized bug-out vehicles can be quite expensive, it is important to know how to choose the best features as well as find ones that will fit your budget. In this article, I will introduce military vehicles and show you why they may be a better choice that others you may have been considering. Capable of driving off road – Most vehicles with a four wheel drive, heavy duty suspension system, and sufficient ground clearance without making the vehicle top heavy. Normally, I don’t recommend lift kits or oversize tires unless you also upgrade the suspension. 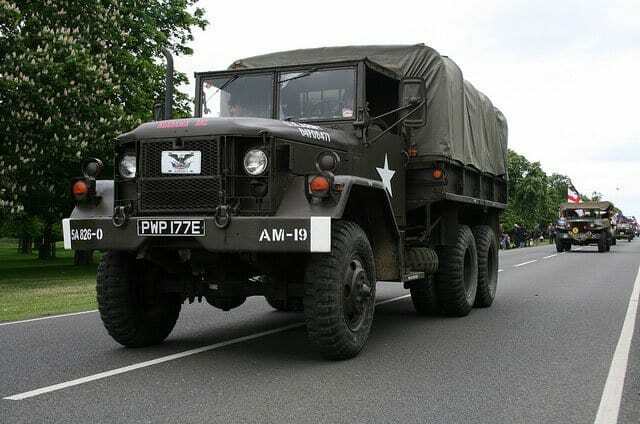 Speed and horsepower – Most US military surplus trucks will travel around 50 mph with standard tires. If you want to go faster, you may need to look at different vehicle type. Vehicle range limits – Surplus military vehicles have tank sizes ranging from 78 gallons in a single tank or twin 55-gallon tanks for a total of 110 gallons. Unfortunately, the average surplus vehicle also only gets 8-10 miles to the gallon. If you cannot carry enough fuel to reach your destination, then the vehicle may become useless from a travel point of view while you are in transit. You can try adding extra gas tanks, choose a vehicle that you can live in and defend in case it must be taken off the road, choose a flex-fuel vehicle, or look for something else that has a better range. Dependability – Aside from having a tendency to not break down, it is also important to find a vehicle that you can do minor to mid-level repairs on. Buying the extra parts along with the vehicle will guarantee that you have them and you won’t have to pay unreasonable high prices to get them in a time of social unrest. Hauling capability – This includes the number of passengers, available cargo space, and the total weight the vehicle can carry. If your vehicle choice fits your dependability and traveling range requirements, but does not have enough cargo space, you may want to make modifications that expand your ability to store things on the top and sides of the vehicle. Just remember that you should not exceed the weight limits no matter where those pounds come from. Safety and Security Feature to Add on As Needed – No matter which vehicle you choose the first thing you need to do is replace all windows with Plexiglas because it is stronger and more shatter resistant than normal automotive or truck glass. If you feel that bullet proof glass is needed, then install it. All doors should be heavy armored and have gun ports for self-protection. The vehicle should also have self-sealing gas tanks and self-sealing tires. Front bumper guards will protect lights and the radiator, while rear bumper guards can deter other vehicles from ramming or trying to knock your vehicle off the roadway. If you are going to drive over rough terrain the installation of 5 point seat belts is an excellent safety option. Off the grid abilities – In order to make your journey easier to manage, see if you can install small solar panels or small shell shaped wind turbines on the roof. Electricity will give you a chance to recharge medical equipment, cell phones, and other small devices that may be needed for one reason or another. Depending on the output of the power generator, you may be able to run a small battery powered refrigerator. If the vehicle is big enough, you may want to have a portable toilet, and carry a portable camping shower. Regardless of the vehicle size, do not forget to account for water storage and purification. Accident and ramming survivability – The vehicle should have bumper winches to pull itself free of mud pits or other hazards. If the roads are blocked by debris, fallen trees, or abandoned vehicles, the vehicle should also be built strong enough to ram or push obstacles out of the way so you can keep moving forward. If a minor to medium traffic accident can make the vehicle you are interested in undrivable, it is probably not a good vehicle for your needs. Military surplus vehicles are excellent bug-out vehicles. These vehicles are designed to travel over all types of terrain. Even though most larger surplus trucks are 6 wheel drive vehicles, the Humvee is a four wheel drive. M35 series two and a half ton 6X6 cargo truck. These trucks were originally designed as a 10 wheel off the road truck capable of carrying 5,000 pounds of cargo off-road or 10,000 pounds of cargo on paved roads. Trucks in this weight class were classified by the US government as medium-duty vehicles. The M35 truck is available with a canvas soft top or a metal hardtop. The metal hardtop versions were most often found on vehicles that were to be used in cold weather conditions and were equipped with cold weather gear including heavier insulation for the cab, better engine cooling, and heaters for the cabs. All of the earlier versions of the M35 built between 1950 and 1990 were gasoline powered vehicles. The 1991 through 1994 the new M35A3 featured diesel-power and automatic transmissions. The M109 was a van version of the M35 series of trucks. These vehicles were used for maintenance shops or mobile command vehicles. A variant of the M109 had a heavy duty winch on the front bumper that was designated M185. This vehicle also carried a light duty crane, tools, and other repair items. A 1.5 Ton Trailer (also available as military surplus) is an excellent addition to your bug out vehicle. It should come with sides and a canopy cover to protect the cargo. The trailer must have good ground clearance and compatible tires to the bug out truck. The hitch should be strong enough to safely carry the load. There should be power assisted brakes for safe controlled stops. These trailers were mainly used with the M35, M39, and M109 series trucks. The basic cargo version was designed to transport a 5-ton load in all weather over all terrain. There were three series in this grouping of five ton 6×6 trucks. They were the M39, M809, and the M939. Over the 40 years that these trucks were in service there had been component improvements, but all the trucks were basically mechanically very similar. During the early 1960’s the M39 was powered by a multifuel engine. Later on, standard diesel engines replaced the multifuel ones. Both the M39 and the M809 have 5 speed manual transmissions. The M939 series was a design improvement package of the M809 that included an updated engine, automatic transmission, and brakes. This truck had a new, much larger cab, and a tilt forward hood. For each of the above series of trucks, there was also a van truck version. In the M39 series, it was called the M291. This vehicle in the M809 series was called the M820. In the M939 series, it was called the M934 and M935. The expansible van trucks had a 17-foot long van body with a slide-out section on each side of the box. When these floor sections were extended the working floor area was over 12 feet wide. 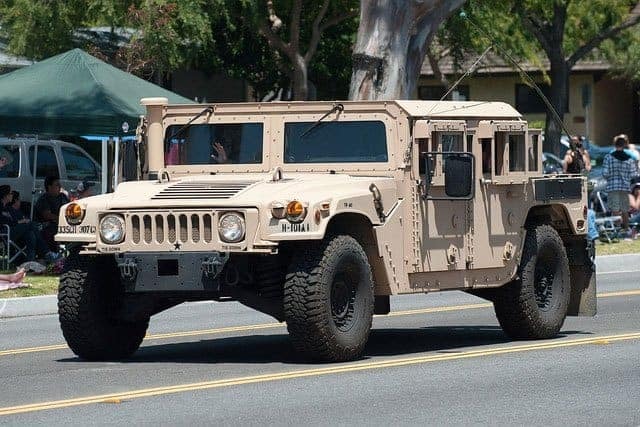 The Humvee was a four wheel drive, diesel powered, automatic transmission military light truck. 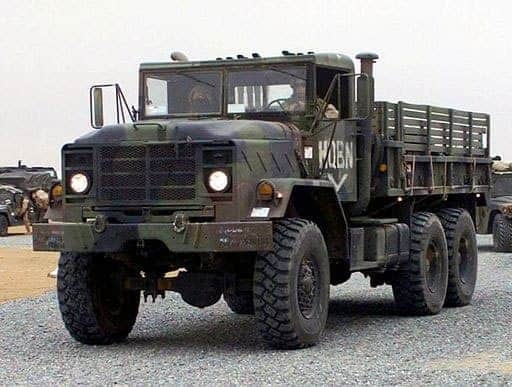 It was originally developed to replace the aging fleet of jeeps, ambulances, commercial utility cargo vehicles, and other light trucks in the US military services. The Humvee is it good all-terrain vehicle. It has an excellent record of crossing deserts, operating in forested areas, and is good at fording rivers and streams. This vehicle also has good ground clearance, which is a plus when you are going through rough terrain. Even though these vehicles come with a lot of advantages, there are some other things you might want to do in order to have a vehicle that meets more of your survival needs. Both the 2 ½ ton and the 5-ton vehicles can be reworked to have either a standard cab or a crew cab with air conditioning and heating. I would recommend 50-inch tires, with a central tire inflation system. A Cummins Diesel Motor with an Allison Automatic Transmission, with a high/low range transfer case. If you are traveling through rough terrain, heavy duty air brakes are required. On all trucks, the head light system should be upgraded with an off the road lighting system. To increase the range of these trucks extra fuel tanks need to be added. The actual layout of the custom box van will be a personal decision depending on the following factors. How many people will be traveling, type of terrain to be crossed, the distance from the starting point to the bug out location, and the amount of time needed to get there. The amount of storage space required for all of the supplies to get the group to the final destination, and have enough supplies to last for one year. The box van will need to be heated and air conditioned. There should be a water filtration system, sink, shower, self-contained commode, self-contained fresh water and waste water tanks. Solar or wind power generators with an inverter and battery system. A roof hatch for easy access to roof racks and other storage areas. Locking pass-through door between the cab and the van box. All doors should be lockable. A rear lift gate for lifting heavy items. Expand the standard cab into a crew cab that can seat and sleep up to 6 people comfortably. This can be done by raising the cab roof. A roof rack to increase the amount of cargo carried. A liftgate for loading and unloading equipment. A heavy duty winch mounted on the front bumper. Extra fuel tanks to increase the range of the vehicle. For Safety and Security, I would recommend having good locks on all doors and windows. Overhaul the diesel engine, automatic transmission, and the dual range transfer case. All terrain 36-inch dual bead lock tires. Mount the air filter on an extension pipe in order to keep it from getting overly dirty. This adaptation will also make it easier for the Humvee to ford rivers and streams. 4-person cab with a heater and air conditioning. Upgrade the seats for something more comfortable and with good back and neck support. Replace all doors, the top, and add a slant back to the vehicle. All of these parts can be made of aluminum and can be locked when necessary. All of the aluminum parts must have water seals so they don’t leak. The color scheme should be one that is durable, stealthy, and does not stand out in the countryside. Spare tires mounted on the rear bumper in locking mounts. A winch on the front bumper. These days, not many people think to use surplus military vehicles when searching for a bug out vehicle. Nevertheless, these vehicles are already designed and tested for all terrains and conditions. They also cost less than a newer commercial vehicle of the same capacities. 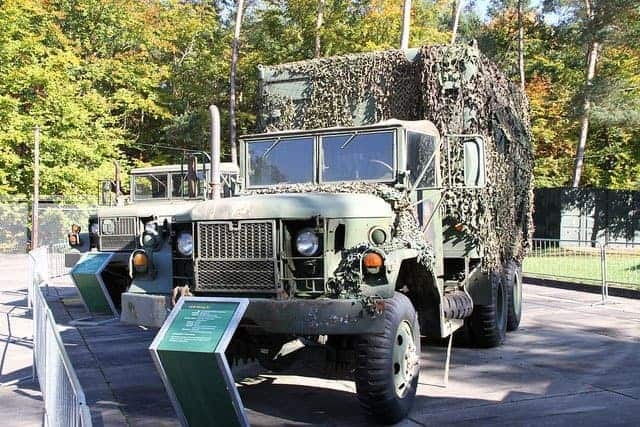 If you have a military surplus vehicle as your bug out vehicle, I’d love to hear more about your experiences in the comment section below.